Probiotics are live microorganisms that can assist digestion, increase nutrient absorption, reduce inflammation, prevent candida overgrowth, and improve immune system function. 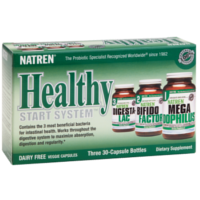 The Healthy Start System from Natren contains the three most beneficial probiotic strains for total intestinal health. The Dairy-Free version is a complete probiotic starter package containing one bottle each of Megadophilus, Bifido Factor and Digesta-Lac Powder in veggie capsules. Taken in the morning, these products will get every day off to a Healthy Start.